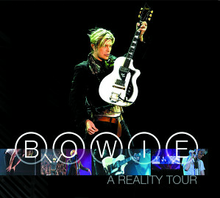 A Reality Tour is a live album by David Bowie that was released on 25 January 2010. The album features 22 and 23 November 2003 performances in Dublin during his concert tour A Reality Tour. This is an audio version of the concert video of the same name, except that it adds three bonus tracks. The digital download on iTunes adds two more bonus tracks. The set list includes tracks spanning Bowie's 30 plus years in the music business, from The Man Who Sold the World (1970) all the way to the then current Reality (2003), along with collaborations such as "Sister Midnight" (with Iggy Pop; originally from The Idiot (1977)) and "Under Pressure" (with Queen; released as a single in 1981 and later found on Hot Space the following year). There is a bit more focus, however, on tracks from the albums released since the Earthling World Tour in 1997, Heathen (2002), and Reality, whose tracks constitute 10 of the 35 songs performed. The only exception from his latest albums is Hours (1999); no tracks from this album were included on this release, possibly due to poor reception of the album, and no songs from the album were included in his touring repertoire. Other albums with no appearance included the cover album Pin Ups (1973), Never Let Me Down (1987), the albums produced with the band Tin Machine (Tin Machine (1989) and Tin Machine II (1991)), and Black Tie White Noise (1993). Aladdin Sane (1973) & Station to Station (1976) also made no concert appearances in the video, although songs from both albums were performed on the tour. A notable inclusion into the performance was the set of three songs from The Rise and Fall of Ziggy Stardust and the Spiders from Mars (1972) as the final encore. Though Bowie had performed the pieces many times through his career, the pieces had not been toured regularly since 1978 when the live interpretations were featured on the Stage album released that same year. The interpretations presented often a heavier and more complex sound than those of the album releases to suit the band for which the Reality album had been written; a more dynamic "Rebel Rebel" was arranged as an opener which included notably some audience participation and Bowie finishing his performance with the Irish phrase "Tiocfaidh ár lá", which means "Our day will come". Use of audience vocals appear in a number of tunes, including "All the Young Dudes"and "Life on Mars? ", which the audience faithfully sang along to. Electronic songs such as "Sunday" and "Heathen (The Rays)" feature new "Spooky Ghost" guitar arrangements by Gerry Leonard. "Loving the Alien" is rearranged for acoustic guitar and is performed solely by Bowie and Leonard. All songs written by David Bowie except where noted. Gail Ann Dorsey – bass guitar, backing vocals, lead vocals on "Under Pressure"
^ Erlewine, Stephen Thomas. "Davis Bowie - A Reality Tour". AllMusic. Retrieved 11 August 2017. ^ Schumer, Ben (26 January 2010). "David Bowie: A Reality Tour". PopMatters. Retrieved 11 August 2017. ^ "David Bowie 'A Reality Tour'". Q. April 2010. p. 126. ^ "David Bowie - A Reality Tour". Rolling Stone. January 2010. ^ McCormick, Neil (21 January 2010). "Bowie: A Reality Tour, CD Review". The Telegraph. Retrieved 11 August 2017. ^ Schreurs, Jason (29 September 2009). "David Bowie to Release Double Live Album of A Reality Tour". Exclaim.ca. Archived from the original on 7 May 2010. Retrieved 5 October 2009. ^ "iTunes version of Reality Live completes setlist". BowieNet. 21 January 2010. Archived from the original on 1 May 2012. Retrieved 22 January 2010. ^ "CHART WATCH #352 - auspOp". auspOp. 23 January 2016. Retrieved 23 January 2016. ^ "Austrian Album Chart – 7 February 2010". austriancharts.at. Retrieved 21 January 2016. ^ "Belgian (Wallonia) Album Charts: David Bowie – A Reality Tour". ultratop.be. Retrieved 30 January 2010. ^ "Belgian (Vl.) Album Charts: David Bowie – A Reality Tour". ultratop.be. Retrieved 30 January 2010. ^ "Dutch Album Charts: David Bowie – A Reality Tour". dutchcharts.nl. Archived from the original on 10 February 2010. Retrieved 30 January 2010. ^ "Tops : Christophe Maé est de retour côté singles et les Black Eyed Peas en tête des albums". Chartsinfrance. Archived from the original on 5 February 2010. Retrieved 2 February 2010. ^ "Chart Track – 28 Jan 2010". chart-track.co.uk. Retrieved 5 February 2010. ^ "Portuguese Album Chart". portuguesecharts.com. Retrieved 5 February 2010. ^ "Swiss Album Chart – 7 February 2010". swisscharts.com. Retrieved 20 January 2016. ^ "Chart Stats – David Bowie – A Reality Tour". chartstats.com. Retrieved 5 February 2010.